DOHUK, Iraq -- A spokesman for the governor of Iraq's Anbar province said Monday that about 500 people -- both civilians and Iraqi soldiers -- are estimated to have been killed over the past few days as the city of Ramadi fell to the Islamic State of Iraq and Syria (ISIS). The estimates follow a shocking defeat as ISIS seized control of the Anbar provincial capital on Sunday, sending Iraqi forces fleeing in a major loss despite the support of U.S.-led airstrikes targeting the extremists. While Iraqi officials admit ISIS' claim to hold the city is legitimate, a Pentagon official said Sunday that ISIS merely "has the advantage" in the capital of Anbar Province. What the news did make clear, is that after nine months of U.S.- led airstrikes in Iraq, ISIS is still capable of seizing new territory. Bodies, some burned, littered the streets as local officials reported the militants carried out mass killings of Iraqi security forces and civilians. Online video showed Humvees, trucks and other equipment speeding out of Ramadi, with soldiers gripping onto their sides. "We do not have an accurate count yet," said the spokesman, Muhannad Haimour. "We estimate that 500 people have been killed, both civilians and military, and approximately 8,000 have fled the city." The estimates are for the past three days, since Friday, when the battle for the city reached its final stages. The 8,000 figure is in addition to the enormous exodus in April, Haimour said, when the U.N. said as many as 114,000 residents fled Ramadi and surrounding villages at the height of the violence. Local officials have said that ISIS carried out mass killings of Iraqi security forces and civilians. With defeat looming, Prime Minister Haider al-Abadi had ordered security forces not to abandon their posts across Anbar province, apparently fearing the extremists could capture the entire desert region that saw intense fighting after the 2003 U.S.-led invasion to topple dictator Saddam Hussein. Earlier Sunday, al-Abadi ordered Shiite militias to prepare to go into the Sunni-dominated province, ignoring U.S. concerns their presence could spark sectarian bloodshed. By late Sunday, a large number of Shiite militiamen had arrived at a military base near Ramadi, apparently to participate in a possible counter-offensive, said the head of the Anbar provincial council, Sabah Karhout. U.S. Secretary of State John Kerry said he remained confident about the fight against ISIS, despite the setbacks like the loss of Ramadi. Kerry, traveling through South Korea, said that he's long said the fight against the militant group would be a long one, and that it would be tough in the Anbar province of western Iraq where Iraqi security forces are not built up. "In Anbar, where you don't yet have the presence of the Iraqi security forces in the full numbers necessary to take the fight to Da'esh (Arabic acronym for the ISIS) everywhere yet, I underscore 'yet,' there are targets of opportunity, like in Ramadi or somewhere else, where Da'esh has the ability to inflict great damage," Kerry said in South Korea. Sunday's retreat recalled the collapse of Iraqi security forces last summer in the face of ISIS' blitz into Iraq that saw it capture a third of the country, where it has declared a caliphate, or Islamic State. It also calls into question the Obama administration's hopes of relying solely on airstrikes to support the Iraqi forces in expelling the extremists. "We welcome any group, including Shiite militias, to come and help us in liberating the city from the militants. What happened today is a big loss caused by lack of good planning by the military," a Sunni tribal leader, Naeem al-Gauoud, told The Associated Press. He said many tribal fighters died trying to defend the city, and bodies, some charred, were strewn in the streets, while others had been thrown in the Euphrates River. The final ISIS push to take Ramadi began early Sunday with four nearly simultaneous bombings that targeted police officers defending the Malaab district in southern Ramadi, a pocket of the city still under Iraqi government control, killing at least 10 police and wounding 15, officials said. Among the dead was Col. Muthana al-Jabri, the chief of the Malaab police station. 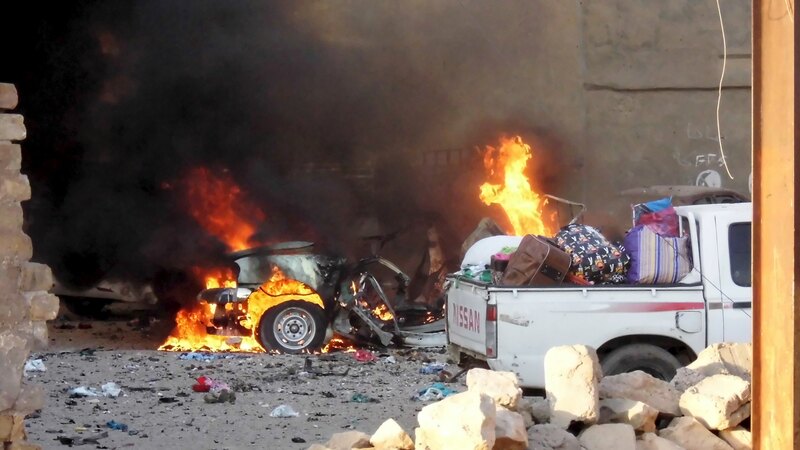 Later, three suicide bombers drove their explosive-laden cars into the gate of the Anbar Operation Command, the military headquarters for the province, killing at least five soldiers and wounding 12, the officials said. The extremists later seized Malaab after government forces withdrew, with the militants saying they controlled the military headquarters. A police officer who was stationed at the headquarters said retreating Iraqi forces left behind about 30 army vehicles and weapons that included artillery and assault rifles. He said some two dozen police officers went missing during the fighting. The officer and the other officials spoke on condition of anonymity as they were not authorized to talk to reporters. On a militant website frequented by ISIS members, a message from the group claimed its fighters held the 8th Brigade army base, as well as tanks and missile launchers left behind by fleeing soldiers. The message could not be independently verified by the AP, but it was similar to others released by the group and was spread online by known supporters of the extremists. Last week, the militants swept through Ramadi, seizing the main government headquarters and other key parts of the city. It marked a major setback for the Iraqi government's efforts to drive ISIS out of areas the group seized last year. Previous estimates suggested the group held at least 65 percent of the vast Anbar province. Backed by U.S.-led airstrikes, Iraqi forces and Kurdish fighters have made gains against ISIS, including capturing the northern city of Tikrit. Videos posted online show a large convoy of Iraqi Shiite militias, purportedly led by Iran-backed commander Hadi al-Ameri, amassing on the outskirts of Ramadi before an expected attempt to retake the city from ISIS. Hadi al-Ameri was the commander of the Shiite militias that helped oust ISIS from Tirkrit. But Williams says that in a predominantly Sunni Muslim province like Anbar, deploying Shiite Muslim fighters may only exacerbate Iraq's deadly religious tensions. The Shiite militias are already accused of murdering Sunni civilians and torching their homes. So in spite of the successes further north, in largely Shiite and Kurdish areas, progress has been slow in Anbar, where anger at the Shiite-led government runs deep and where U.S. forces struggled for years to beat back a potent insurgency. American soldiers fought some of their bloodiest battles since Vietnam on the streets of Ramadi and Fallujah.